Since 1998 we have exported over 75 double deck buses from the UK to various countries such as the USA, Panama, Korea, Canada, Estonia and many other countries in Europe. 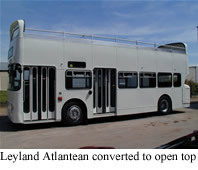 They have been used as sightseeing buses, soft play areas, promotional buses, snack bars and drinks bars. We have undertaken many different modifications on these vehicles, including converting a 1983 Leyland Atlantean to open top (above) for the city of Genk in Belgium. As part of this modification we lowered the height from 4.60 metres to 4.00 metres. 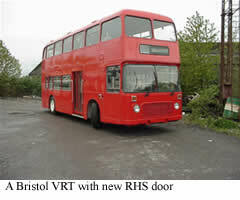 Another major conversion we have carried out giving a Bristol VRT a right-hand side entry door as shown on the left here. As well as these we our able to offer the following other modifications: left-hand drive conversion, partial open top conversion, resprays and the fitting of reconditioned engines and transmissions. We have a good range of vehicles in stock and will be pleased to quote you for the basic bus and whatever modifications you need. We offer a parts and advice service for customers at home and abroad.